Literally meaning “three fruits” in Sanskrit, it is a combination of three fruits, all native to the subcontinent of India. These fruits are, Amalaki (Emblica officinalis), Bibhitaki (Terminalia belerica) and Haritaki (Terminalia chebula). 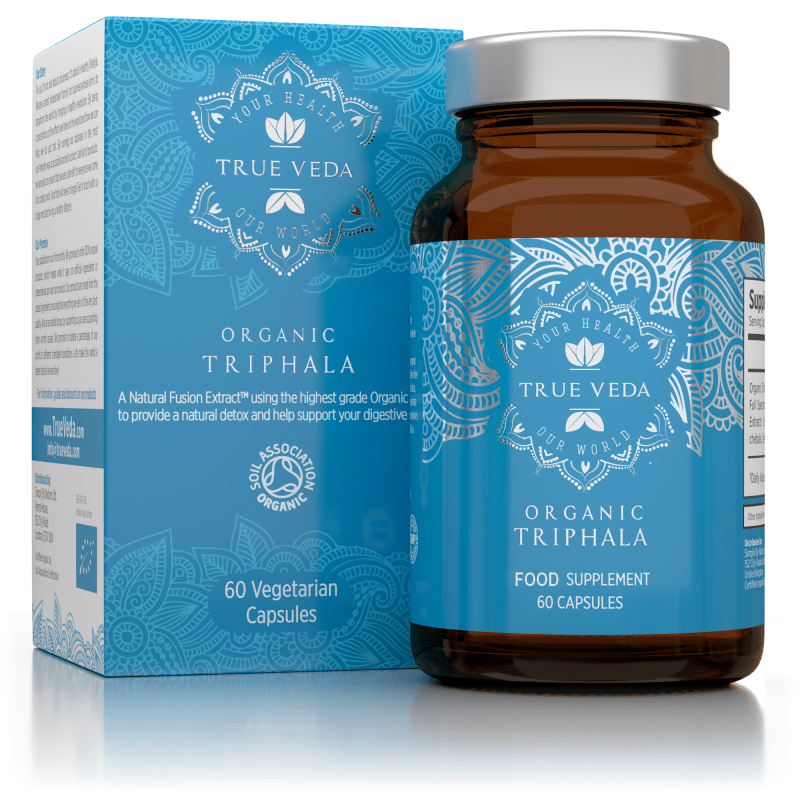 Our capsules are pure & clean and contain only Organic Triphala and are suitable for vegetarians and vegans. Made from the highest quality Organic Triphala extract. We have pioneered and patented a technology that combines CO2 and water based extracts to create a new generation of supplement that have all the plants active components but extracted from natures plants in the most natural way. With this technology, we create an extremely concentrated supplement and potent supplement. This holistic supplement delivers the wisdom of nature with a little going a long way! Turmeric, the main spice in curry, is arguably the most powerful herb on the planet! One of our proudest creations is the True Veda® Turmeric Gold product which retains curcuminoids, turmeric essential oils and a full range of turmeric active ingredients. This means we harness the effects of over 200 of turmeric’s bioactive compounds, not just those of the curcuminoids. Our state of the art extraction process and the addition of organic ginger and black pepper really enhances absorption and substantially increase potency. An award-winning supplement known as Withania Somnifera or Indian Ginseng. Our Ashwagandha ingredients have been created via a process that took 15 years to develop and refine to deliver a full-spectrum root extract to give you maximum benefits and at least three times the potency compared to other brands. Being organically certified by the Soil Association guarantee’s you a pesticide-free and chemical free product which is 100% natural for your body and the environment. There are higher regulatory standards we have to meet to attain certification but we do this to guarantee you get a safe, high quality and effective supplement. True Veda is 100% organic without compromise. 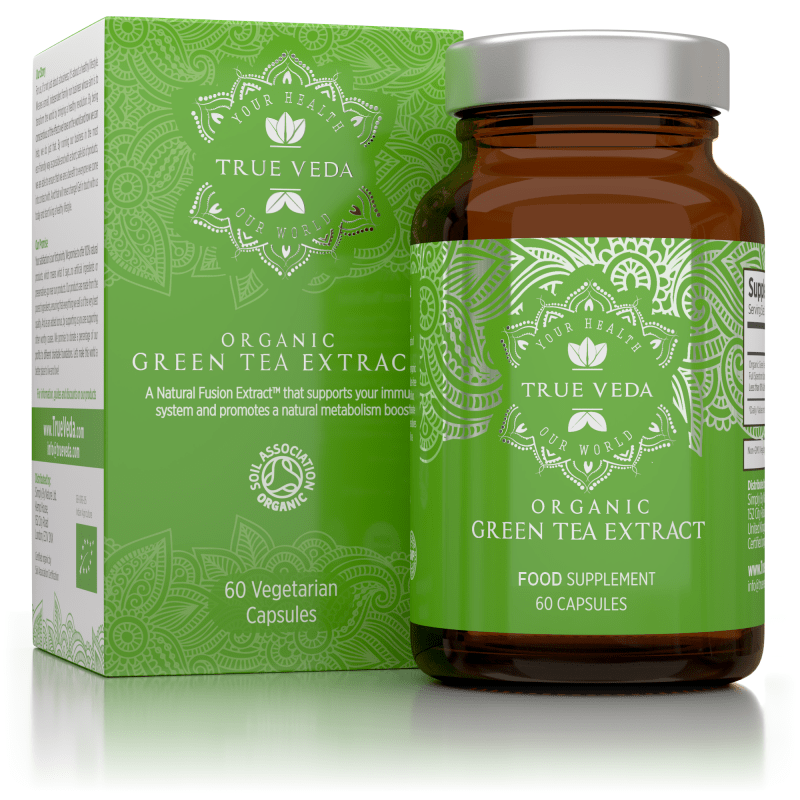 Made from Camellia Sinesis green tea plant leaves this winner of The Beauty Awards “Best Health Supplement 2018” is a full-spectrum extract to give you maximum benefits of green tea with at least three times the potency compared to other brands. Don’t like the taste of Green Tea? Well…True Veda Green Tea has just solved your problem!